Mega Sale! 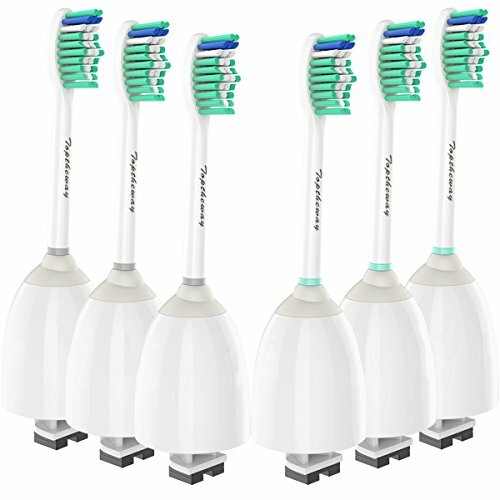 Save 22% on the Replacement Brush Heads for Philips Sonicare E-Series Toothbrush HX7022/66, Fit Sonicare Essence, Xtreme, Elite, Advance and CleanCare Screw-On Philips Handles, 6 Pack by Toptheway by Toptheway at Lash Beverly Hills. MPN: ES001-6P. Hurry! Limited time offer. Offer valid only while supplies last. Why Choose Toptheway Brand Toothbrush Heads? Our manufacturer has racked up 17 years of experience producing a better electric toothbrush head. Why Choose Toptheway Brand Toothbrush Heads? Our manufacturer has racked up 17 years of experience producing a better electric toothbrush head. Each Toptheway toothbrush head is carefully tested by our specialized engineers before they leave the factory. You can always count on the highest quality of products and services with us. FDA approved replacement heads with US Dupont indicator bristles. The soft bristles do not irritate the gums but give a nice clean stimulation. It tightens down correctly and has a very quiet operation, no excessive vibrations and rattling noises. Powerful magnets fit perfectly without letting water inside. Super powerful to remove plaque and prevent gingivitis two times better than a regular toothbrush. Your teeth will feel cleaner for a longer period of time. You will feel like you have gone to the dentist after brushing just one time! Each toothbrush heads equipped with a hygienic travel cap, no more dust. Spend 1/3 money, get toothbrush heads that are most comparable to original Sonicare. Once you buy Toptheway brush heads, we will provide Life time warranty for you. Our Sonicare brush heads e series are made with US Dupont rounded end medical grade Nylon Bristles, which is the same material as the Philips Sonicare toothbrush head; Gentle on your gum and blue reminder bristles fade in color to let you know when it's time to replace the brush head. If you have any questions about this product by Toptheway, contact us by completing and submitting the form below. If you are looking for a specif part number, please include it with your message.